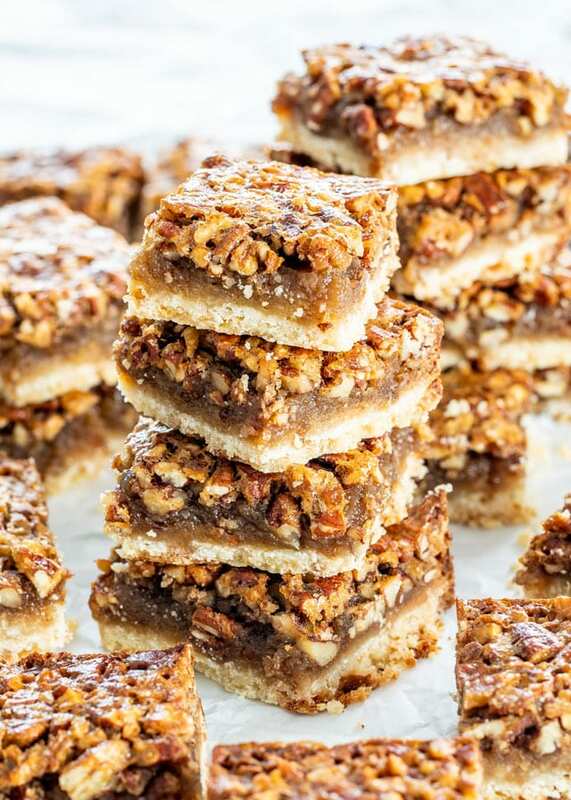 These Pecan Pie Bars are sweet, crunchy, gooey, loaded with pecans, an easy shortbread crust and perfect for a crowd! Just like pecan pie but better! I’m a huge pecan pie fan. I mean HUGE. Whenever I go to a restaurant and pecan pie is on the menu, I always order it. However, sometimes it’s hard to find a really good pecan pie. I don’t like a soggy crust, or not super ooey-gooey, or the flavor is not there. Which is why, I now make my own Pecan Pie, or when I feel adventurous, I make a killer Bourbon Pecan Pie. But here’s what I love about pecan pie bars. They’re the perfect pecan pie in handheld form. Think about it, no plates or forks to dirty, the only thing you’re dirtying are your fingers. 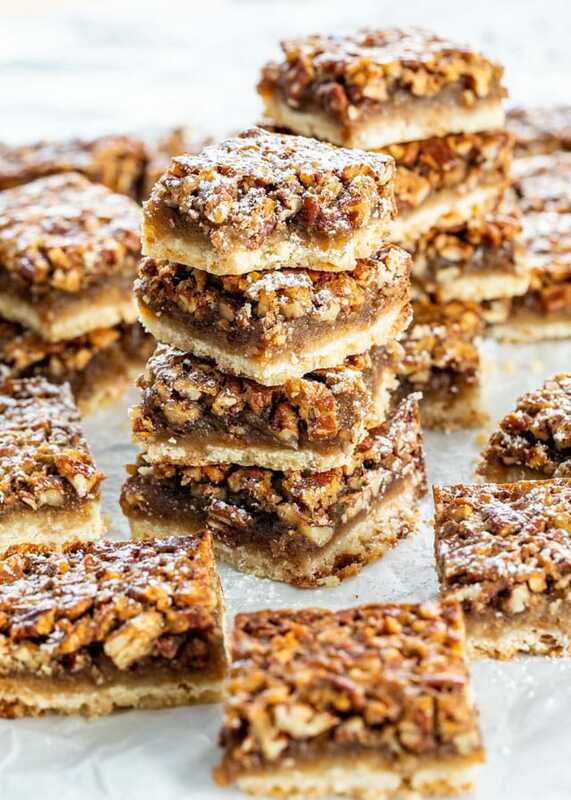 But that’s ok, because these pecan pie bars are finger licking good. 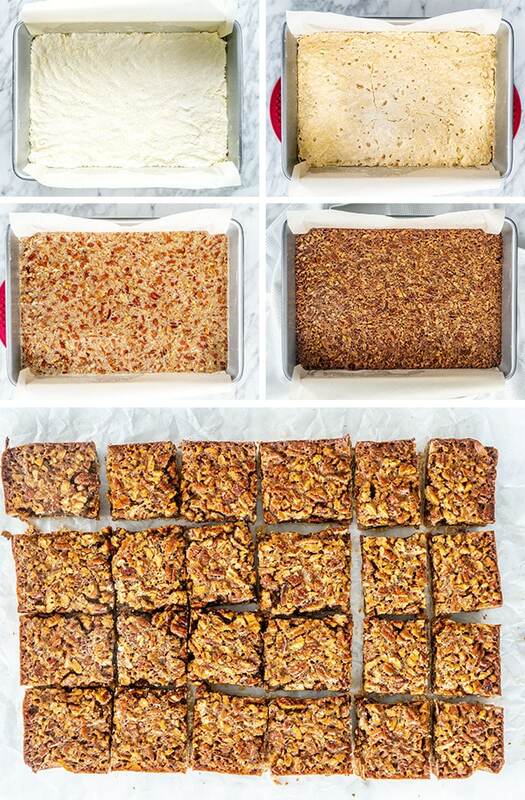 THE PAN – I love using a 9×13 inch metal pan for these bars. The way I prep it is spray it with cooking spray, then line it with parchment paper, but with the parchment paper hanging off the sides to make it easy to lift out bars. THE CRUST – The perfect crust for a pecan pie bar is a shortbread crust. It’s super easy to make, no food processor or mixer necessary, just a pastry cutter or two forks is all you need. A good shortbread has only 3 ingredients; flour, butter and sugar. Nothing else fancy is required. All you do is combine all the ingredients, add a bit of salt to bring out the flavors and use a pastry cutter to blend in the butter. Press the crumb mixture firmly into the bottom of the baking pan and bake it for 20 minutes. THE FILLING – The filling is a classic with a bit of lemon zest thrown in there and trust me, you won’t want to skip the lemon zest. It’s quite subtle but makes a huge difference. Flour, brown sugar, corn syrup, eggs and lots of pecans is the core of the filling, a classic that doesn’t require other twists besides the lemon zest. A pinch of salt is what brings each of these elements together. Mix it all together and pour it over the pre-baked crust, then bake it again for about 40 to 50 minutes. Let this cool completely before cutting into it. Absolutely! 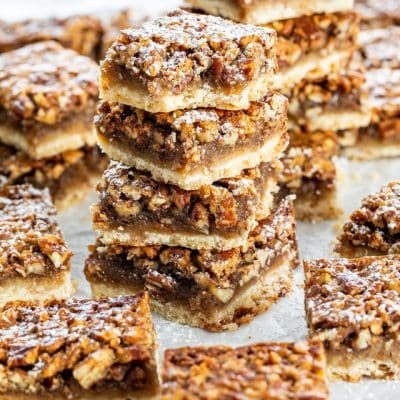 These pecan pie bars freeze great! I find it easier to let them cool completely first, cut them into squares then wrap them tightly in plastic wrap and finally place them in a freezer bag before freezing. This way you can wrap them individually, a few or all together. The day before you want to serve them, take them out of the freezer and thaw them out completely in the refrigerator. All-purpose flour can be substituted with pastry flour or cake flour. Corn syrup can be substituted with honey or maple syrup. Store the bars into an airtight container at room temperature for up to 5 days. I am waiting on the second batch of these pecan bars to come out of the oven. My first batch I made for my church and froze them for over two weeks. The gang loved them and never knew that they had been frozen. This is so easy to make and it taste yummy. It isn’t as rich as a pecan pie so you can eat more. That is a plus. This is on my list of always bake go to. Thanks Jo. My pleasure! So glad you like them!!! Your recipe specifically calls for dark corn syrup but fails to mention what kind of packed brown sugar. It looked like dark brown to me but I could be wrong. The sugars bring different flavors into play. I used dark brown sugar. These are SO GOOD! We made them yesterday. I was using my small KitchenAid food processor to mix the crust, but it’s a bit too small to fit all of it. I had to dump the mixture into a bowl for dh to use the pastry cutter, and it turned out quite well. After two hours, it was firm enough to cut up. We all loved it. This is about the seventh recipe from Jo that I’ve made, which started with BUTTER CHICKEN. ALSO, her cranberry meatballs, which were delish on cornbread for a third meal. That is so wonderful to hear! It’s hard not to eat the entire pan of those pecan bars 🙂 Happy cooking! I made these for the office, and everyone just loved them. I will make them again for our family’s Thanksgiving dinner. She sounds very smart! 😉 We’re so happy to hear that the bars were a hit! I made crust yesterday. Mixed filling this morning. How long do I hv to let it set to thicken? btw, the lemon zest does make subtle difference—great! As written in step 3, it only needs to sit as long as the crust takes to bake and cool. Can’t wait to make these for thanksgiving. They look amazing! Thank you! I’m so happy to hear that you love them! Why did you change the way your recipe prints? It is easier to read but made it narrower so they all take an extra page to print the last one inch of the recipe (nutrition). Thank You. There was an update with the plugin.